A couple of years ago it was difficult to find any restaurants or cafes who proudly proclaimed their support for local produce. Things have changed. This month two new Whangarei food sellers advocating for local food have opened. “Down the Road” featured in an earlier post. Around the same time “Power Plant”, a wholefood and organic store in the Civic Arcade opened. Power Plant is a family business run by Mark and Angela Fuller and their daughter Jasmine. They are all still working other jobs and businesses while running Power Plant. The food is vegan and Mark and Angela are working hard to find local supplies of organic produce. At present they can source enough for the kitchen, but not to sell as fresh produce. Please support food sellers who strive to sell local food. Here is Power Plant’s Facebook Page. The convergence of rapid population growth and climate change threaten our ability to feed everybody. But our thinking about solutions has been a monocultural reflection of how we grow our food. A recent Guardian article suggests switching to organic farming could cut greenhouse gas emissions and still feed the world. We don’t need more “business as usual agriculture”. The 2016 IPES-Food report (page 54) warns us that “feed the world” narratives are one of eight “lock-ins” that inhibits our collective ability to rethink the way we grow food. Advocates of current industrial food systems claim that massive monocultures, synthetic fertilisers, genetically modified crops and toxic chemicals are essential to feed the world. But if we follow the money we are more likely to find they are serving their financial ambition rather than any altruistic concern for the greater good. But we also don’t need purist ideologies about how food should be produced. Rather a diversity of solutions should be explored with each assessed on its own merits. Here are some solutions. Some will work better in a country such as mine (New Zealand) where population density is low, but every bit of food grown (and not wasted) helps. Can food only be called organic if it is grown in the soil? Can organic food be grown hydroponically? When I first studied soil science about 40 years ago, conventional horticulture relied on a handful of macronutrients and micronutrients. Now high quality products are available that supply nutrients and important microbial constituents (Rok Soild is my preferred fertiliser). USDA organic certification is now available to qualifying hydroponic, aeroponic, and aquaponic crop systems. Since the early days of hydroponics, growers have learned how growing in a more controlled environment can reduce or eliminate the need for pesticides. And in these systems herbicides just aren’t needed. These containers are “vertical farms” used by food banks. Crops are grown inside using LED light and energy efficient heating enabling year around production. Aerofarms farms vertically on a bigger scale. This system has detractors but it seems a good option for growing food close to where it is needed without nasty chemicals. Aquaponics is another option – combining fish and produce production. Ben Smith is a local advocate of aquaponics. Lawns are beautiful additions to the landscape and great places for children to play. But in our towns and cities (especially in New Zealand) we waste too much energy mowing lawns when we could be growing more food. Here is a kiwi example of optimising urban lawn space to create lots of food. Most of us have grown up in the traditional garden where food production and ornamentals have there own space. Municipal parks departments also have difficulties coping with the concept of mixing the two. After all fruit trees drop fruit and can be messy! But imagine a landscape where children can eat feijoas, citrus and passionfruit on their way to school. For some, it might be the most nutritious food they get that day. This video shows how a group in Portland Oregon, “glean” fruit to distribute to the needy. Couple this with an intensification of fruit tree plantings in public spaces and we bring good food closer to those that need it. I’m not sure how I feel about lab grown meat, but it gets around some of the environmental problems that are presently coupled with intensified agricultural systems. A new initiative in New Zealand produces a “chicken free chicken” out of pea protein. So here’s a diverse range of approaches to getting food to people. What is most important is for people to make their own assessment about what works best for them and their communities and to have a whole lot of tolerance for other ways of growing food. 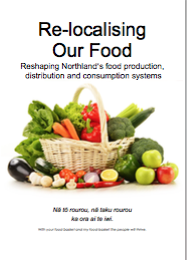 Our new government, led by Jacinda Adern is a win for MMP and sustainable food systems. To form a government in New Zealand a party has to obtain a majority of seats. In a mixed member proportional (MMP) government, any party will need to work effectively with smaller parties to sustain their government. Our new Prime Minister, Jacinda Adern has skilfully woven a coalition agreement with New Zealand First, with support in supply and confidence from the Green Party. This result represents another advance in our political system. It is fitting that 124 years after Kate Sheppard led the fight to win the vote for women, a female Prime Minister is the first leader who has only voted in the MMP electoral system. Ms Adern must be aware that the continuation of her government can only be achieved by the continued success of her coalition partners. Early signs are that she has the skill and awareness to lead us to a new style of co-created governance based on strong consensus. The new government also represents a win for the environment with the three partners supporting the establishment of a Climate Commission and agreeing to legislate emission reduction goals to comply with the Paris agreement. Climate change action is touted as a clear winner in the Labour, Greens agreement. Climate change was on the agenda this election and we can be sure that it will be even more prominent next time, so it will shape future governments. This will cause the National Party to rethink its stance. For the first time the Green Party will have ministerial roles (albeit outside cabinet). These roles include climate change and conservation. A feature of the coalition agreements is the commitment to regional development. Both New Zealand First and the Green Party are champions of local economies. The agreements also include the intention to prevent foreign ownership of farms. I have no doubt that we need to turn back dairy intensification and diversify farm incomes to reduce environmental impacts (more about this in future posts). The new government will discontinue subsidies of irrigation that fuel intensification. The plan to increase the minimum wage potentially has a benefit for regional economies. We are a low wage economy and government assistance for wage and salary earners enables employers such as the foreign owned fast food chains to keep employment costs low. In effect this is a tax payer subsidy for these employers, and in the case of foreign-owned corporates, part of our taxes disappear off-shore. According to the Drawdown Project, the 31% reduction of global greenhouse gas emissions can come from food system and a further 14% from land use. We need to engage with government to ensure that the synergies between climate change action, their new forestry programme, and regional development aspirations are realised and support the development of sustainable food systems. Sugar feeds cancer cells. This is the key finding of a nine year research project published in Nature Communications. This article summarises the findings. And today on Radio NZ Jesse Mulligan interviewed Robert Lustig about the various ways that we are addicted, and sugar is possibly the most ubiquitous addiction. Here is the interview. Robert Lustig’s new book, The Hacking of the American Mind discusses the influence of the food industry in promoting addiction. He is down on dopamine. We seek a dopamine by feeding our addictions. He suggests we need more serotonin instead. Robert Lustig promotes his four Cs to resist addictions and support our happiness. CONNECT – face to face connections fuel our empathy and build community. CONTRIBUTE – to friends, families, others and your communities. COPE – exercise, practice mindfulness and get plenty of sleep. COOK – real food and avoid processed food. We feed sugar to our children. We continue to allow it to be promoted widely. This has to change!